Yesterday, Mayor Jenny Durkan announced Tracy Rector as the 2018 recipient of the 13th Annual Mayor’s Award for Achievement in Film. The Mayor’s Award for Outstanding Achievement in Film recognizes an individual or entity for exceptional work that has significantly contributed to the growth, advancement and reputation of Seattle as a filmmaking city. Rector is a mixed race (Choctaw/Seminole) filmmaker, curator, community organizer, and co-founder of Longhouse Media. She has directed and produced over 400 short films and is currently in production on her fifth feature documentary. Her work has been featured on Independent Lens, Cannes Film Festival, ImagineNative, National Geographic, Toronto International Film Festival, the Seattle Art Museum and in the Smithsonian’s Museum of the American Indian. Rector’s Longhouse Media focuses on galvanizing the indigenous and local community through film production. Tracy is a 2016 Stranger Genius, has received the National Association for Media Literacy award for outstanding contributions made in the field of media education, is a Firelight Media Fellow, WGBH Producer Fellow, Sundance Institute Lab Fellow, Tribeca All Access Grantee, and is the recipient of the Horace Mann Award for her work in utilizing media for social justice. The award was presented by Deputy Mayor Shefali Ranganathan on behalf of Mayor Durkan at the Seattle International Film Festival Opening Night. 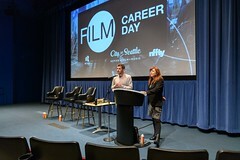 To learn more about the award and previous winners, visit seattle.gov/filmandmusic/film/mayors-film-award. While she spent 32 years working in tech, Sandler has been a musician all her life, having picked up the violin when she was eight years old. She played with friends and in community orchestras on the side throughout her decades working in the corporate world. Ensuring that musicians are valued is at the top of Sandler’s priorities, as housing costs in Seattle continue to rise and low-income residents are pushed out. “I don’t know how young musicians are going to stick in the area,” she says. 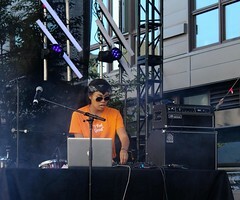 As the Seattle Times reports, artists are having to choose between music and making ends meet. Do you have questions for the Music Commission, or issues you’d like their help on? Reach out them at seattlemusiccommission@seattle.gov. Seattle director Lynn Shelton’s latest film, Outside In, opens at SIFF this Friday, April 6; the film premiered at the Toronto International Film Festival in 2017, and had its U.S. premiere last month at SXSW. It stars Jay Duplass as a convicted felon attempting to reassemble his life after 20 years of wrongful imprisonment and explores his relationship with his former high school teacher, Carol (played by Edie Falco), who was key to securing his freedom. Leavitt recently started a production company called Electric Dream Factory and has been making films in Seattle for the past decade. She often works closely with Shelton and other local filmmakers, including Megan Griffiths (whose new film Sadie premiered at SXSW as well). Outside In is Shelton’s seventh consecutive feature shot in Washington State. The film was shot primarily in Granite Falls, a town with a population of about 3,000, shooting for 20 days in October and November of 2016 and totaling over 500 days of work for local crew. Nine out of the film’s fifteen roles were played by Washington actors, and editing and audio post production were completed in Seattle. Catch Outside In starting this Friday night at SIFF Cinema Uptown. 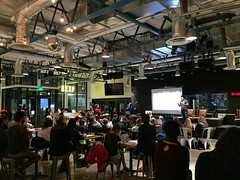 This week at the Vera Project, the Seattle Office of Film + Music’s Mixer featured a presentation from Ventures Nonprofit on how to make and save money through participants’ creative enterprises. The presentation began with a round of peer speed coaching, where guests were invited to meet someone new and describe their financial goals for the next year. Hughes later guided the audience through steps to build financial capacity, which she broke into four components: paying down, negotiating and disputing debt; determining sources of income; creating and maintaining a savings plan; and building or repairing credit. Participants went home with information and worksheets to help them think through their finances (which you can find here and here). Ventures is a Seattle-based nonprofit that empowers aspiring entrepreneurs through providing access to business training, coaching, microloans, and incubation and other services for low-income and underserved entrepreneurs. You can check out their programs and events on their website. Next month’s Mixer will be 5:00-7:00 P.M. on April 25 at SIFF, where guests will get a preview of SIFF’s Northwest Connections program. The Mixer is free and all ages. Have something you’d like to see at an upcoming Mixer? Email us at filmandmusicoffice@seattle.gov. 2018 is a big year for Seattle at the SXSW Film Festival—three films from local directors are premiering there this week. One of those films is the sci-fi Western Prospect, the first feature-length project from local production company Shep Films. Shep Films was created by Pacific Northwest natives Chris Caldwell and Zeek Earl. Graduating in the midst of the recession in 2009, Caldwell and Earl started their company small: they began filming commercials and built up their production apparatus over time. They were eventually able to produce their first short film, “In the Pines,” which screened at SXSW and other festivals in 2012. Prospect began as a short film, which premiered at SXSW in 2014. It tells the story of a teenage girl and her father attempting to strike it rich on an alien moon before they run into danger. The short film caught attention at the festival, which led Shep Films to begin working on a feature-length script. 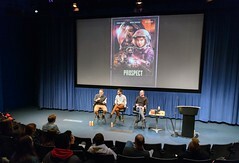 You can watch the trailer for Prospect here, and check out their other projects at shepfilms.com. Students in a Seattle Central College classroom working on a Photoshop tutorial. About forty students from Franklin and Rainier Beach High Schools had the opportunity to try their hands at different creative trades at the first-of-its-kind Media Arts Try-a-Trade event last week, hosted at Seattle Central College. The Try-a-Trade event was the result of a partnership between Seattle Public Schools, Seattle Colleges, and four City of Seattle departments. Students in the Seattle Central College Visual Media program led the high schoolers through different activities, all aimed at giving them a crash course in what it would be like to work in various visual media industries. The high schoolers, all of whom are enrolled in similar classes at their schools, broke into groups and rotated through five stations: fashion photography, photo editing, video, portrait photography, and product photography. (Some of the students put the lessons they learned about photography and lighting to good use right away—by taking selfies with their classmates.) While enjoying lunch provided by Sizzle Pie, the students then had the chance to ask questions of a panel of industry professionals and graduates of the Seattle Central program. Students participating in a fashion photo shoot. While the City and local schools often collaborate on workforce development efforts, this was their first time applying the “try a trade” workshop model to artistic industries. Students are often encouraged throughout their K-12 education to pursue four-year degrees after high school, but this overlooks the many thousands of high-paying trade jobs that do not require an education at a university. 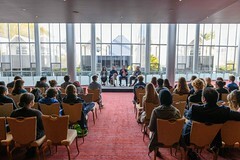 Listening to the panel of professionals from employers including HBO and Nordstrom Studios, students saw first-hand that people who pursue technical education can go on to have lucrative careers doing what they love. Events like the Media Arts Try-a-Trade are part of the City’s larger effort to help prepare students for successful careers. Learn more about how you can host youth interns at your organization this summer here. Interested in other ways to share your industry expertise with young people? Sign up to offer other career-connected learning opportunities here. 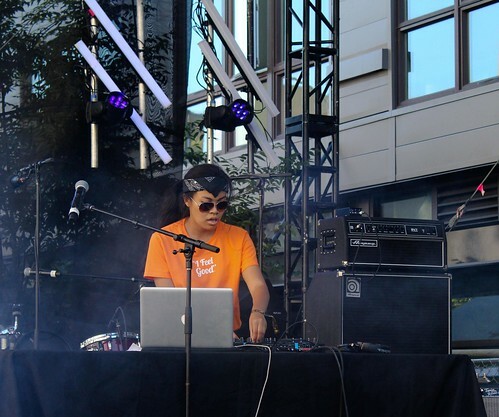 You can also sign up for our newsletter to stay up-to-date on future events, and contact us with ideas or questions at filmandmusic@seattle.gov. Seattle creatives joined the Office of Film + Music at KEXP for the February 2018 Mixer, featuring local singer/songwriter/guitarist/podcaster John Roderick. Mixer guests spent the first hour networking and enjoying drinks, before Roderick took the stage to give an overview of his life as an artist and lessons he’s learned along the way, along with a short Q&A session. Roderick described a career full of mini-successes—making a living “one $160 check at a time.” Many artists don’t have a single big break and experience smooth sailing from there, but rather build their careers steadily over years. He advised the young artists in the crowd to stay humble and continue to say yes to even seemingly trivial opportunities, since even small checks add up over time. He also spoke about his experience dealing with mental health issues and their effects on his life and career. You can find more information about John Roderick on his website, or follow him on Twitter. The March Mixer will feature a presentation by Ventures, helping Mixer attendees translate lessons learned from Roderick’s talk into concrete steps they can take to make and save money for their creative enterprise. We’ll see you there on March 28, 5:00-7:00 p.m., at the Vera Project. Film permitting is now online! In its ongoing mission to make Seattle the premier location for film production, the Seattle Office of Film + Music has implemented a new online permitting tool for film permit applications. The new system streamlines the film permitting process for clients, and provides location managers with helpful information on popular Seattle filming locations. 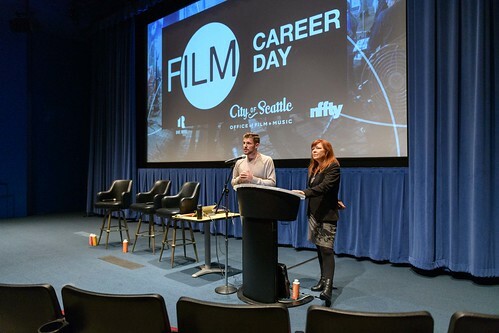 Since 1991, the Seattle Office of Film + Music has prioritized film production in Seattle with streamlined permission coordination and permitting. Continuously focused on creating the best starting point for film productions, the new online system will save time for both applicants and staff, so we can issue film permits faster and more efficiently! Check it out at seattle.gov/filmpermit. Please reach out to filmoffice@seattle.gov with any questions.